Does Mr Driessen know what a political statement he has made? His words are not in the least sensational. His observations make perfect sense. But they will be heresy to some fanatics. "Boys are affected by divorce very deeply because 85 per cent of custody goes to the mother and guys just disappear. That needs to change," he said. "We need to have a family split-up philosophy where we realise that sons need their fathers. All custody and access should be 50-50." Many women - and some men - do not want to know, especially from an educational specialist, that children from broken homes are lagging behind. That challenges the orthodoxy that women alone can raise children (of both sexes) just as well as a couple. I am not talking here about single mums finding it a battle having been deserted by an irresponsible father; those struggling and doing their best to fill the void. I am talking about the intellectual elite who told and taught that family structure is neither here nor there. In fact a family structure free from the heavy hand of the patriarchy may be preferable. Those that purposefully set about harnessing the power of the state to replace fathers with anonymous public money. So await the bru ha ha this triggers. The first objection put up will be the poverty problem. It is poverty - not lack of a father. If I had the time this morning I could write the response myself as predictable as it will be. But I don't. Yesterday's budget and the budget from 2000/01 are depicted below. 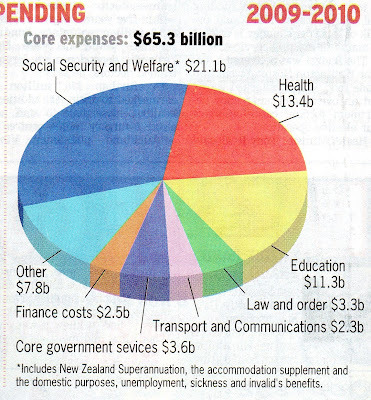 The figures show that in 2000/01 social welfare made up 34.6 percent of government spending. After nine years that have been described as "the best of times" social welfare spending now accounts for 32.3 percent. Labour's three terms will be forever characterised in my mind as a negligent, colossal, wasted opportunity to pare welfare back to being what its political forbears intended - a safety net. Further to my post this morning - no plan, no vision, more welfare. - A 31 percent increase in total spending forecast by 2013. - Unemployment to rise to almost 100,000 by 2010/11. - Accommodation supplement expenditure to rise by 45 percent. - Childcare assistance funding to rise 41 percent - why, when unemployment and DPB is also forecast to rise? Why are we paying other people to look after children we are also paying their unemployed parents to look after? - "Other" benefits spending to rise by 39 percent. - Cost of Super to rise 32 percent (because there will be no lift in qualifying age despite life expectancy growing steadily). - Income related rents expenditure to rise 47 percent. - Spending on the "In Work" tax credit to drop by 11 percent. That's what ambition looks like. What an uninspiring, lacklustre, roll-over-and-die bunch of figures. Back in 1935, when Social Security was being debated, nobody talked about billions of dollars of unfunded liabilities. “Trillions” was beyond comprehension. Social Security generates unfunded liabilities because current Social Security payroll taxes go to pay for current benefits, and nothing is set aside to cover future benefits of current taxpayers. FDR’s smart advisors assumed that the number of taxpayers would increase as fast as the number of people collecting benefits, but the number of people collecting benefits has grown faster, and now Social Security is going broke. In New Zealand the same is true. The number of people collecting benefits has grown faster than taxpayers. This table doesn't extend to the present (unemployment well down, DPB steady, Sickness and Invalid's well up) but you get the picture. It seems to me, and has for a long time now, that this country needs to be reforming welfare because of the damage it does first, and because of the cost second. But I grow less and less optimistic that the first imperative will be realised. Sadly it will be the second. Sadly because the second will hurt people more. You see we could have done this in a planned and compassionate way while the economy was in good shape. Instead of saying to existing beneficiaries, there is no money available for your benefit, we should have been saying to young people, there is no money available to you if you drop out of school, don't support yourself or any child you produce. The distinction is sharp. Let's flesh it out. For example, there are over 4,000 teenage parents on a benefit right now. They all came into the system after 2005 - during a time of low unemployment. These individuals will typically stay on welfare until their late 30s. So a crude calculation means they alone are going to cost $1.6 billion. Of course that leaves out the costs of their families health and education and other social needs which could easily double the figure. If our politicians were prepared to bite the bullet and close the door to future long-term dependants billions could be saved. Instead John Key is acting like Obama, promising to retain all social security entitlements and even extending them. Being in a recession shouldn't and hasn't eased the urgent need for reform. It has brought the crunch closer. But the sooner the country wakes up to that, the softer the crunch will be. I really, really don't want to be insensitive or offensive here but there is something that always puzzles me. Tragically, a keeper was attacked and killed by a lion today and the lion was subsequently destroyed. This is a rare and valuable animal kept in captivity for the purposes of, one assumes, preservation of the species. It is commonly understood that such an animal, given the opportunity, is quite capable of killing. So when it does just that, we destroy it. Can anyone explain that to me? There is no link available yet but NewstalkZB is reporting the Law Society is opposing the three strikes bill. They want sentencing discretion to stay with the judge. A spokesperson didn't think the "blunt instrument" that is three strikes was conducive or consistent with "social development". They also believe that a three strikes policy could have the unintended consequence of encouraging criminals facing their third strike to kill any potential witnesses. Um. If judges are to continue to use their discretion I wish a few more would give public safety a higher priority. Update; The radio report led me to assume that the Law Society had just submitted on the bill but according to this report that happened earlier in the month. I am mystified as to why it has become newsworthy again today. The Child Poverty Action Group has released a list of recommendations for the budget. Its a socialist wishlist and as such, a waste of their time. 1) Set a target date to end child poverty, and undertake to produce a child impact assessment for all proposed legislation. There is only relative poverty in NZ. By definition it is impossible to end it. 2) Treat all children as deserving support and acknowledge that parenting is important work. Recognise the ‘In-Work Tax Credit’ as part of family assistance that is needed by all low-income families, as the ReStart package proves. This should be done by adding $60 to the first child rate of the Family Tax Credit. As I have commented before if there is no financial incentive to work more people will opt for or stay on benefits. Having no working parent is bad for children. 3) Increase social assistance payments to adequate levels, and make good on the pre-election promise of raising the earned income disregard for beneficiaries from $80 to at least $100. What is an 'adequate' level? The second part of 3 I agree with. 4) Abandon development of proposals for income splitting. Agree. Flat tax would be better. 5) Provide free primary health care for under-18s, at all hours. The resources aren't there. Many people can afford to take their children to the doctor but can't find one. 6) Increase the operating grants for low-decile schools to cover all children’s basic educational needs, including the provision of amenities such as swimming pools. The grants are already heavily weighted towards low decile schools. 7) Ensure that 20 hours free ECE is extended to Playcentre, Kôhanga Reo, state kindergartens, and not-for-profit private and community-based education and care services. As with GPs the lack of amenities is more of a problem than affordability. And already, many low-income children have a single mother who is paid to look after her children full-time and, on top of that, paid a subsidy to put them in ECE. This is a recessionary budget isn't it? 8) Urgently address the severe overcrowding and poor living conditions of thousands of children by expanding the state house building programme and providing extra funding to community housing providers. More state housing = more ghetto-like neighbourhoods. Explain to people that having children makes them poorer (unless they are on a benefit). If they are already poor, it might not be a great idea having more. 9) Tax capital gain from residential property in a fair way, for example by using the risk-free rate of return method. Oh yeah. Keep on taxing the 'rich' to pay for all of the above. They won't mind. In addition, the group urges the Government to implement plans to improve children’s access to better nutrition, including making breakfast in schools available unconditionally to all children in all Decile 1, 2 and 3 schools. If their parents can't afford to get a couple of pieces of toast into them before they go out the door they need budget advice. Not more money. In an increasingly multi-racial country more care should be taken with the term 'racist'. Housing NZ want to add a clause to new housing tenancy agreements requiring that permission is sought for someone to be bailed or paroled to one of its properties. It isn't racist. If the clause specified permission must be sought only for Maori or Pacific Islanders it would be racist. This is also a favourite with the Maori Party. To incorrectly label a law that disproportionately affects Maori as racism. In the past genuinely racist laws have existed. 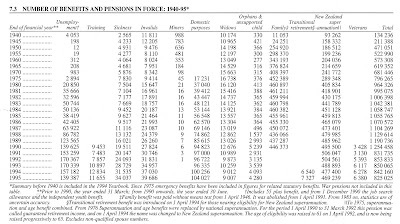 Maori women were barred from drinking in pubs, Asians were barred from collecting the old-age pension. These laws were racist because they excluded someone based purely on their race. Following Michael Bott's line of thought we would arrive at the following; Any law that Maori disproportionately break is a racist law. Dear me. Same old solutions trotted out again. This time by the Prime Minister no less. Prime Minister John Key is proposing to combat the drug P by banning its main ingredient, pseudoephedrine, from use in over-the-counter cold and flu tablets. Methamphetamine consultant Mike Sabin said pseudoephedrine had been taken off shop shelves and made prescription-only in Oregon, which was now leading the United States in combating the drug. "If you want to control meth, you've got to control pseudo - and getting rid of pseudo is the only way you can control it." Methamphetamine availability will increase as Mexican DTOs [drug trafficking organisations] establish a stronger foothold in the methamphetamine market by supplying increasing amounts of Mexican ice methamphetamine. How-ever, methamphetamine production within the Oregon HIDTA region will continue to decrease. Outdoor and indoor marijuana production will rise in the near term. Thousands of acres of public lands in Oregon on which law enforcement policing is limited will enable Mexican DTOs to operate an increasing number of cannabis grow sites in rural,unpopulated areas with relative impunity. Additionally, Asian DTOs will most likely establish additional indoor cannabis grow operations within the Oregon HIDTA region to supply increasing demand for high-potency marijuana in the HIDTA region as well as in neighboring markets. Today, it’s undeniable that Oregon’s laws were hugely successful in one area: The meth labs that endangered children and created hidden toxic waste dumps in basements and backyards across the state have been all but eliminated. As the officers indicate, however, that success has borne unintended consequences — thanks to a massive influx of meth supplied by Mexican drug cartels. Interviews with numerous local law enforcement officials and several meth addiction counselors — as well as a pending federal meth case investigated by the Portland Tribune’s news partner, Fox News 12 — suggest that Oregon’s legislative changes contributed to a radical transformation in the underground meth economy, one that in some ways is making the problem even more difficult to fight. “The labs are gone, but there’s more meth,” said a longtime Portland Police Bureau drug cop, Sgt. Brian Schmautz, who stressed that he was only speaking for himself, not the agency. Recent drug seizures by Customs indicate strongly that New Zealand's borders are under a three-pronged attack from the illicit drug trade. The first attack is the emergence of New Zealand as a target of transnational drug trafficking syndicates, notably trafficking in Amphetamine Type Substances (ATS). Crystal methamphetamine ("ice") is becoming the drug of choice for drug traffickers, with more than 3kg intercepted at the border so far this year in four separate significant seizures. One of the interceptions led to a joint Police/Customs investigation team recovering an additional 7kgs of recently imported crystal methamphetamine. The second attack is the use of New Zealand as a transit point for large drug shipments destined for the larger Australian market. This is particularly the case with cocaine arriving from South America. In the first four months of this year Customs seized more than 15kgs of cocaine in eight separate cases. Investigations showed it was all destined for Australia. The third attack is the continuing increase in the amount of precursor substances being imported for methamphetamine production. In the first four months of this year more than 770,000 tablets, or powder equivalent, of ephedrine and pseudoephedrine-based substances were seized in 175 separate incidents. This compares to 830,000 tablets seized in 444 cases for the whole of 2003. I repeat, first do no harm. Mrs Simcock likes to use an analogy around school attendance to help people understand and not fear the law. “It is illegal in New Zealand to not send your child to school. I am sure every parent has, for some reason, kept their child away from school before. No one ever expects that all parents will be charged and made criminals because of those one or two days that most parents have kept their children away from school. How does that work? One could just as easily claim that retaining section 59 - the ability to claim a defence of using reasonable force - is analogous to the law regarding school attendance. Ergo, it is illegal to not send your child to school (it is illegal to strike your child) except when reasonable circumstances dictate (except when the force used is reasonable in the circumstances). I don't believe the public is confused. They know there is now legally no defence at all for smacking a child because smacking constitutes assault. The only uncertainty lies in whether the police will prosecute or look the other way. "The rest of the world says, 'Things are serious, but they are not desperate yet'. Here we say, 'Things are desperate, but they are not serious yet.'" I went looking for the interview and also noticed this earlier one; Richard Thaler: libertarian paternalism. This encompasses ideas like enrolling everybody in schemes but allowing them to opt out. So state decides what is best for you (paternalism) but can't force you to comply (libertarianism). Or state decides what is bad for you and uses every measure it can (stopping short of banning) to make you less likely to do it. It's all about 'nudging' people to make the right choices. In the 2003 BEFU, Treasury predicted, based on 2003 actual figures, the uptake of Paid Parental Leave (a welfare benefit) would increase 27 percent by 2007. What actually happened? The 12,372 people receiving PPL in 2003 grew to 28,852 - or 133 percent - in 2007. Lesson; If you throw free money at people and want to guess how many will hold their hands out, make your estimate high and then double it - at least. The scale of the practice of grandparents raising grandchildren seems unknown. Yesterday a reader alerted me to some Family Court statistics regarding the application for a parenting order (or in old jargon, custody). In 2007 alone at least 2,452 grandparents applied. The year before, an only slightly smaller number. If on average around 60,000 children are born each year it is conceivable that over 1 in 30 children is being raised by a grandparent, or will be in the future. While there can be no doubt these children will be better off with someone who genuinely wants them, they nevertheless impose a significant burden on older people who often have limited resources (notwithstanding many grandparents are still relatively young). It is an issue that gets canvassed at each election with calls for greater financial support from government. Unexpectedly, at a Grey Power meeting, one women stood up and said, they are your flesh and blood, your grandchildren, just get on with it and stop asking for handouts. While grandparents raising grandchildren deserve appreciation for stepping into the breach, the woman had a point. This is yet another example of people wanting the taxpayer to assume a responsibility that is actually theirs. It is exactly this type of thinking, a societal expectation that parents should be paid to produce children they cannot care for, that often lands the grandparent in the subsequent bind. Too inconvenient to break the law? Chester Borrows says the gangs have resigned themselves to abiding by the law, because it is going to be too inconvenient to skirt around it. At first glance this is an absurd assertion. Like gangs abide by other laws because it is just too inconvenient not to. Sure. But at second glance, there may be a grain of truth lurking. In the interests of breaking weightier laws some gang members might just comply. A senior cop told me in the 1990s that gangs were becoming less visible because the kind of serious money they were involved in meant they wanted to attract less attention. It remains to be seen how the lower echelons react. The last two days in Wellington have been wild. But the dog gets walked by the waterline every day - come rain or shine. That is where she runs at top speed,impervious to the conditions, barking like a maniac at the gulls held up in the gale force winds, un-phased by waves crashing over her despite the fact she has never demonstrated to us she can swim. Our beach has changed shape over night. All manner of sea-life has been cast adrift; starfish, paua, mussels and many animals we couldn't identify. Getting out and into it is invigorating but there is no way to stay dry. My bright idea of 100% cover-up, a $2 shop orange poncho (which David says looks like an enormous condom) was an utter failure. Eventually we had to abandon the beach leaving one hardy soul trying to secure his boat hull. Yes. You can keep your warmer climes with blue days on blue days. Give me the dramatic changeability Wellington serves up any day. Today the ferries are cancelled. Here's one leaving Wellington on a similar day with a captain no doubt wishing he'd stayed in berth. Warning; Don't watch if you get seasick.